Never before has the U.S. had so much oil spurting up out of the ground and sloshing into storage tanks around the country. There's so much oil that the U.S. now rivals Saudi Arabia as the world's largest producer. But there has been some concern that the U.S. will run out of places to put it all. Some analysts speculate that could spark another dramatic crash in oil prices. Everyone in the oil trading business needs information. One thing they want to know these days: How full are oil storage tanks in places like Cushing, Okla.? To find out, ask a professional — someone with eyes on the ground, and in the sky. Genscape, an oil intelligence service, uses planes, helicopters and satellites to track where and how much oil there is all over the world. The company "does a James Bond approach and flies over the storage field twice a week," says Hillary Stevenson, a manager at the firm. In the U.S., you can tell how full some oil tanks are by flying over them and looking down. Others require a little more sleuthing, "by using IR or infrared technology cameras and flying over the tanks," Stevenson says. In Cushing, there are fields of giant storage tanks, some the size of high school football stadiums. Genscape estimates they're about 70 percent full. As the storage tanks get closer to capacity, some analysts say that will drive prices lower. Nobody knows that for certain and there are lots of scenarios. But as space gets tight, it gets increasingly more expensive to store oil. That should discourage speculators from buying oil and storing it, hoping to sell it later for a profit. If fewer speculators are buying, that means there's less demand and prices fall. "We're running out of storage capacity in the U.S.," Ed Morse, global head of commodities research at Citigroup, said at an event recently in New York. "And we're seeing the indication of the U.S. reaching tank tops. It's hard to know where the price goes down, but it does go down." The price of oil has already fallen from $100 a barrel last summer to $45 or $50 lately. Morse said lack of storage space could drive oil down to about $20 a barrel. But there's plenty of disagreement about that. Brian Busch, the director of oil markets at Genscape, says oil prices could fall, but not that much. "If we saw crude oil that was trading [in the $30 range], $38-$35, that would not surprise me," he says. But Busch says no one truly knows. The recent fighting in Yemen pushed prices higher. If China's economy started growing faster, that could raise prices. But an Iran nuclear deal might push oil prices down. "The analogy I would make is if you were in Boston and you look at the last three months and say, 'Oh my gosh, we're going to have 2 feet of snow every month,' " he says. "If you took that same straight-line projection, you would say by the end of August we're going to be under 15 feet of snow." Just as snow melts as the temperature rises, demand for oil rises in the summer. People drive more, more refineries are up and running and Merriam expects that those big storage tanks won't be as full. As far as what all this means for gasoline prices, the EIA estimates prices will stay flat through this summer. That's still more than a dollar cheaper than last year. There's never been so much oil coming out of the ground, filling up storage tanks in the United States. There's so much oil now the U.S. rivals Saudi Arabia as the world's top producer. Some analysts now worry the country is running out of space to store all that oil, which means it would have to be sold fast, which could spark another dramatic crash in oil prices. NPR's Chris Arnold takes a look at just how likely that is. CHRIS ARNOLD, BYLINE: If you're in the oil trading business, you need information, and one thing you want to know these days is how full are oil storage tanks in places such as Cushing, Okla. To find out, you might want a professional, someone with eyes on the ground and actually in the sky. HILLARY STEVENSON: Genscape does the James Bond approach and flies over the storage field twice a week. ARNOLD: That's Hillary Stevenson. She's a manager at Genscape. It's a kind of oil intelligence service that uses planes and helicopters and satellites to track where and how much oil there is all over the world. 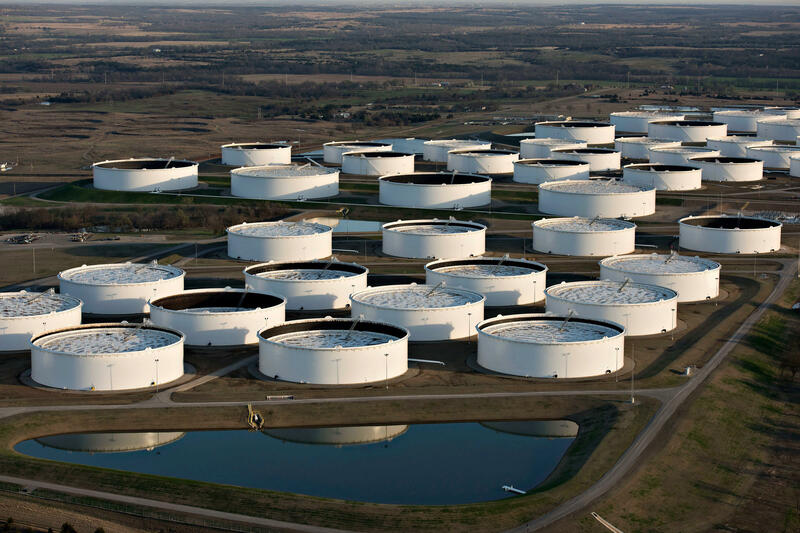 Some oil tanks in the U.S. you can tell just by flying over and looking down and seeing how full they are. Others require a little more sleuthing. STEVENSON: By using IR, or infrared technology, cameras and flying over the tanks. STEVENSON: We're at about 70 percent utilization right now. ARNOLD: As the storage tanks get closer to full, some people think that that's going to drive oil prices lower. Now, nobody knows that for certain. There are lots of different scenarios, but as storage space gets tight, it gets increasingly more expensive to store oil. That, the thinking goes, will discourage speculators from buying oil and storing it, hoping to sell it later for a profit. If fewer speculators are buying that means that there's less demand and prices fall. Ed Morse is the global head of commodities research at Citigroup. He spoke about this recently at an event in New York. ED MORSE: We're running of storage capacity in the U.S., and we're seeing the indication of the U.S. reaching tank tops. It's hard to know where the price goes down, but it does go down. ARNOLD: The price of oil's already fallen from around a hundred dollars a barrel last summer down to $45 or $50 lately. Morse says lack of storage space could drive oil down to around $20 a barrel. But there's plenty of disagreement about that. Brian Busch is the director of oil markets at Genscape. He thinks oil prices could fall, but not by that much. BRIAN BUSCH: If we saw crude oil that was trading in the $30 someplace - $38-$35 - that would not surprise me. ARNOLD: But Busch says you just never know. The recent fighting in Yemen pushed prices higher. If China's economy started suddenly growing faster that could raise prices. An Iran nuclear deal, on the other hand, that would probably push oil prices down. But even putting all those other factors aside, many experts just don't think we're actually going to get that close to running out of storage space. Rob Merriam tracks oil supplies for the Energy Information Administration. He says some of the current oil glut is actually seasonal. ROB MERRIAM: The analogy I would make is if you were in Boston and you'd look at the last three months and say, oh, my gosh, we're going to have two feet of snow every month. If you took that same straight-line projection, you would say by the end of August we're going to be under 15 feet of snow. ARNOLD: Just like snow melts as the temperature rises, with oil demand rises in the summer. People drive their cars more and more refineries are up and running, and Merriam expects that those big storage tanks will get less full. As far as what all this means for gasoline prices, the EIA estimates prices will probably stay about flat through the summer. And compared to last year, that's more than a dollar cheaper. Chris Arnold, NPR News. Transcript provided by NPR, Copyright NPR.